The importance of the Treaty of Rome lay in the fact that even at the moment of signature Germany and France did not agree. Germany wanted the common market, while France was more enthusiastic about the new atomic energy agency, Euratom. Bonn was keen to abolish tariffs on manufactured products; Paris was determined to protect the incomes of its farmers. The future strength of the European enterprise rested on a shared willingness to put aside such differences in the cause of compromise. There is a mythology, particularly prevalent in Britain, that says that the EU has always reflected a close identity of interests and outlook between the continent’s two largest nations. This explains the success of what has been called the Franco-German locomotive. The reverse is true. The Germans and the French have argued from the outset about the shape of Europe. In Paris, integration has been about building a firebreak against an overmighty US. For an Atlanticist Germany, Europe has been a route back to national reunification and the way to banish the demons of recent history. Shortly before the Benelux nations came up with a blueprint for a European Economic Community, France had scuppered German plans for a European defence association. In the decades since the Rome treaty, Germany’s federalist inclinations have frequently collided with the Gaullist preference for national sovereignty. For France, the single currency was an instrument to contain its partner’s economic dominance. For a Germany reluctant to surrender the Deutschmark, the euro was the necessary route to its desired political union. Berlin is mostly protective of the EU’s smaller nations, France disdainful. The habit of compromise has been entrenched by the Elysee Treaty — an agreement that by institutionalising bilateral co-operation at every level of government has generated centripetal force to counter the natural centrifugal forces. Even here, a close observer will spot the forced accommodation. The treaty’s German-language text includes an affirmation of the transatlantic relationship; the sentiment somehow never made it into the French version. Such agreements have served at once as a foundation and catalyst for the wider bargains within the EU that have driven the process of unifying Europe. If France and Germany could bridge their differences in the search for a shared European interest — the one sacrificing sovereignty, the other, ultimately, giving up its precious national currency — how could their partners in the enterprise refuse to make their own compromises? British politicians never quite grasped this, wasting their time instead in a vain quest to drive a wedge between two nations. Germany’s instincts are almost Anglo-Saxon, the argument has run, so surely we can prise it away from France? Theresa May has absented herself from the celebrations to mark the Rome treaty’s 60th anniversary, but, on past form, the prime minister will try the same divide-and-rule tactic when Brexit negotiations get under way. And once again it will fail. Germany’s Angela Merkel does want to strike a reasonable deal with the departing UK, but not at the expense of her relationship with Paris. The deluge of crises these past few years has robbed European leaders of a capacity to think about opportunities. Stagnant economies, a eurozone under siege, the rush of new migrants and the new populism have drained confidence. No one has lost money betting against Europe. Even now, a breakdown of the Brexit talks could destabilise the union. Marine Le Pen’s bid for the French presidency puts a still darker cloud on the near horizon. Were the National Front leader to win, nothing would be certain. So what better moment to imagine the opposite. That the skies may be lightening, that the Europe of the next few years, albeit in a modest way, will surprise the Jeremiahs, and that the process will start with another political bargain between Germany and France. The odds are that Ms Le Pen will lose — to the independent centrist Emmanuel Macron, the favourite in the presidential race, or, possibly, to the Republican party’s François Fillon. Mr Macron is the more pro-European of the two; and Gaullist Mr Fillon the more radical about economic reform. What unites them is a recognition that something has to be done to break France’s economic stasis and consequent political enfeeblement. France has to modernise to become relevant again. Berlin has been waiting for just this message. France’s weakness has left Germany exposed and the EU unbalanced. By default, Ms Merkel has found herself at once the continent’s reluctant leader and its principal villain. The chancellor wants above all to restore the old partnership with Paris. So does Martin Schulz, the Social Democrat challenger in this autumn’s German election. Mr Schulz would find Mr Macron the more amenable partner. So might Ms Merkel. Both would try to make it work with Mr Fillon. There is no magic formula to fill the cracks in a fractured union. A Franco-German locomotive has less traction in an EU of 27 than six. But a restored relationship between Berlin and Paris would be an important source of confidence. It might also mark the beginning of a new “core Europe” with the will and capacity to deepen co-operation. Hard as it is to be optimistic about Europe, it is time to temper some of the pessimism. NEW HAVEN – The idea of a tax on robots was raised last May in a draft report to the European Parliament prepared by MEP Mady Delvaux from the Committee on Legal Affairs. But, these measures do not have widespread popular support. If support is not widespread, the tax, even if imposed, will not last. When taxes on high incomes are raised, usually in wartime, it turns out to be only temporary. Ultimately, it seems natural to most people that taxing successful people to benefit unsuccessful people is demeaning to the latter, and even the recipients of the handout often do not really want it. Politicians know that: they usually do not campaign on proposals to confiscate high incomes and pad low incomes. So, taxes must be reframed to remedy income inequality induced by robotization. It may be more politically acceptable, and thus sustainable, to tax the robots rather than just the high-income people. And while this would not tax individual human success, as income taxes do, it might in fact imply somewhat higher taxes on higher incomes, if high incomes are earned in activities that involve replacing humans with robots. - Gold closes above the 30-day SMA and sustains higher. - The SPDR Gold Trust ETF follows suit. - Both are expected to cross their strong overhead resistances in the near-term. The interesting part in gold’s story is that the commodity has entered into a contracting range, a breakout from which is imminent. I am of the opinion that Aurum will eventually choose the upward trajectory. I repost this weekly U.S. dollar index (NYSEARCA: UUP) chart to highlight the intense selling pressure that the greenback is facing. Upon a closer look at the chart presented, it becomes evident that the currency is being pushed below the previous tops (marked by the dotted horizontal pink trendline), which should have acted as the support. The U.S. dollar index is on the verge of breaking down in the form a head and shoulders pattern. If the dollar index closes below the important neckline support of 99.50 on a weekly basis and remains depressed, then we can expect levels closer to 96. Such a tragic fall will act as the booster shot for the dollar-denominated precious metals in the near-term since it reduces the bill for the gold importing nations and consequently, enhances demand. Any immediate breakdown in the U.S. dollar will act as the much-needed trigger that gold and GLD need to levitate. Gold may also witness increased buying as fear begins to take control of the world markets. Now, this fear does not necessarily have to occur because of a panic fall in the global markets, it can also reign supreme if the tensions between the U.S. and North Korea continue to escalate. 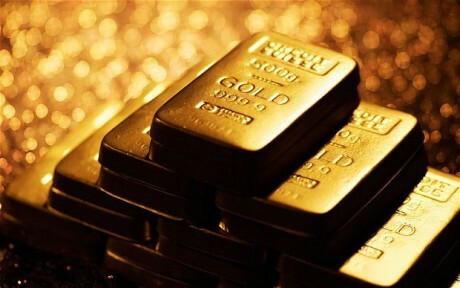 Gold has historically been an investor’s best friend in times of rampant fear and crisis. It might seem like I am being overly optimistic on gold but I am just reading the technical price charts and conveying the sentiments of the broader market which are reflected in the resurgence of gold. It would definitely be an utter disappointment if the precious metal fails to cross the resistances discussed above after such a strong display of strength in the past several weeks. Having said the above, I will make sure to update my readers if a potentially negative event hampers the rally in gold. So, stay connected! The European Union tried to envelop the periphery and the core into one structure. In theory, it was to be a union of equals, but increasingly it has become a periphery rotating around a core. Within the center, the periphery rotated around the true core – Germany. This pattern remained until 2008 when the rotation became less of an orbit than a centrifugal force. In England – and I choose that term to distinguish it from Britain – the centrifugal movement is now palpable, and the movement away from the center shows every prospect of shattering Britain. I was at a financial conference in London where the major issue, reasonably, was the future of the economy. While important, that is not the most significant question facing Britain. Far more important than Brexit’s financial implications are whether Scotland will end its union with England and what Northern Ireland will do. The idea of Scottish independence is rooted in the fact that the Scots see themselves as a different nation from the English. There has always been an undercurrent of Scottish nationalism that did not quite manifest as a very serious movement until now. Part of the Scottish argument for independence pivots on economics. But the more important force is the one sweeping Europe: nationalism and self-determination. The Scots want to be Scots because they are Scottish. It is hard to build this into an economic optimization model, but that is the weakness of economics. The Scottish question arose before Brexit, and that vote allowed the issue to reignite. The Scots voted to remain part of Britain by a relatively small margin, and they believe that another round will do it. The financial community is calculating the financial impact of such a move. But the political significance strikes me as more important. As for Northern Ireland, it has long been torn by nationalism. It is divided by Catholics, who identify with the Irish Republic, and Protestants, many of English origin, who identify with England. They waged a bloody civil war, a follow-on to a bloody rebellion that had waxed and waned for centuries. After nationalist sentiments were at least temporarily quieted, the Brexit debate introduced economic questions that could reignite the struggle for Irish vs. English loyalties. This leads to a vital geopolitical issue. If Scotland re-emerges as an independent nation, and if English power is expelled from Northern Ireland, this would not only turn back the clock centuries, but other possibilities would emerge as well. One of the reasons the English sought union with Scotland was to make it impossible for foreign powers, particularly the French, to threaten England from the rear. This possibility seems archaic, but it actually isn’t. Europe has major, systemic wars every century. At the moment, such a war seems unthinkable, but nothing is unthinkable in Europe. The European Union is weakening and fragmenting. And in the broader global framework, this scenario is even more likely. What an independent Scotland’s foreign policy would look like is unknown, and it may remain in some sort of confederation with England. But if not, Scotland would return to its old stance. It is weaker than England and, therefore, needs a stronger ally. England will see this stronger ally as a potential threat. Therefore, full independence and an evolution of tensions in Europe or globally could reasonably reignite a very old set of tensions to England’s north. While some assert their right to national self-determination, others will challenge that right, and that creates geopolitical complexities, to say the least. In traveling to another part of Europe’s periphery, I will find a variation on this theme. Long ago, Poland and Hungary were both significant regional powers. In recent centuries, both lost their sovereignty at various points. Poland was divided by the Romanov, Habsburg and Hohenzollern dynasties. Hungary was part of the Habsburg Empire. After World War I, collapsing empires freed both countries, but that freedom lasted only as long as it took Germany to re-emerge. Poland was occupied by Germany and the Soviet Union. Hungary remained free, with limited freedom of action because of Germany’s power, until the Germans occupied it in 1944. After World War II, it had formal sovereignty but was actually controlled from Moscow. Given this past, the likelihood of both nations dissolving under pressure was extremely high. Neither did, and both gained full sovereignty in 1989 when the Soviet Union withdrew from Germany. Almost immediately, Poland and Hungary were drawn into the European Union and NATO. Their primary motive was to build their economies and retain their national independence, particularly if Russia re-emerged as a power. In that sense, they promptly traded elements of their sovereignty for peace and prosperity. They would remain Poles and Hungarians but also become Europeans. It was much the same deal as the Scots made and the Irish refused. The Scots made a deal to retain their identity but not autonomy. The Irish fought to keep both. Poland and Hungary willingly entered into Europe for two reasons. First, after experiencing fascism and communism, one of their priorities was to develop a political culture that would render them immune from the contagion. In their view, Europe had freed itself from fascism and guaranteed this freedom in an institutionalized form in the EU. The bloc would protect both countries, or so they thought. Second, the price for entering Europe would be low. They could enjoy the benefits without giving up nation self-determination, and that meant they remained sovereign. After 2008, Europe began its ongoing move to the right and nationalism. Eastern Europe started this movement first by electing Hungarian Prime Minister Viktor Orbán and then electing a similar government in Poland a few months later. This created a strain between these countries and the EU. In the British Isles, England and Scotland sought to pull away. But Eastern European countries were pushed away. The Polish and Hungarian governments were elected by large margins in elections mostly free of fraud. No one challenged the elections’ legitimacy. However, the EU challenged the policies of both governments on a range of constitutional shifts concerning the judiciary and the media. Neither government hid their general intentions. The voters knew and wanted what they were voting for. However, the same thing these countries hoped to gain from joining the EU, immunization against fascism, now collided with the EU’s attempt to protect its general ideology. From the EU’s perspective, what the Poles and Hungarians were doing went beyond the pale of acceptable liberal democratic behavior. From the standpoint of Hungary and Poland, they had adhered to the heart of liberal democratic behavior: Their governments had won free elections. In challenging the right of an elected government to chart its course, it was the EU that was violating liberal democratic values. The exercise in political theory is of interest, but the heart of what I am arguing is that just as the British periphery is fragmenting, the Eastern European periphery is also fragmenting. Some regimes are now pulling away from other countries and the EU; other regimes are drawing closer. This fragmentation has critical geopolitical consequences in the short term. As the EU alienates Poland and Hungary, further fragmentation will take place as these two countries try to find a balance between Europe and Russia, rather than simply being committed to the center, particularly Germany.